A perfect mix of foam: soft enough for hours of gaming, yet sturdy and durable. Patented and unique lightweight metal foot design. Extra large wheels, for smooth rolling. Sturdy rim doubles as a footrest. Full backwards swivel movement, allows reclining of the backrest for a horizontal position. Forward swivel movement, allows for support while in gaming position. Extra high, 4 way adjustable adjustable arm rest. 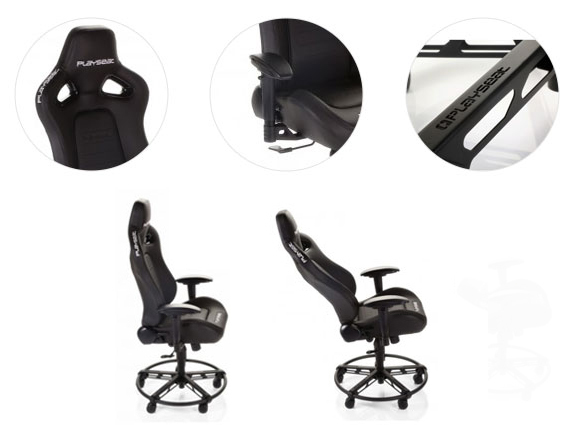 The ultimate all round gaming chair is here: Playseat® L33T! For the people that want the best, most comfortable, most fun gaming experience, Playseat® introduces the Playseat® L33T. It doesn't matter which game you play and it doesn't matter if you use an Xbox, PlayStation or PC, this is the elite gaming chair you need! Full backwards swivel movement allows complete reclining of the backrest for a flat position and forward swivel movement allows for support while in gaming position. The extra high, fully adjustable arm rest, featuring up/down, forward/aft and left/right movement makes sure you will always find the ultimate gaming position. This is the chair for those who want to game for hours, in the best possible way!